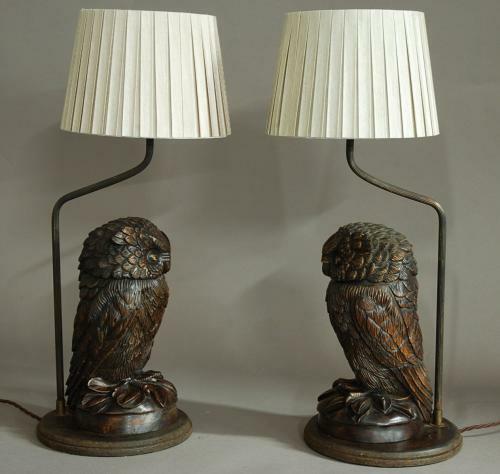 The owl bases would originally have been decorative tobacco jars but have been converted into table lamps some years ago. The owls are very finely carved and have a great patina (colour) and are set with glass eyes, the figures being mounted on wooden bases. The lamps are in very good condition for age, there is slight shrinkage to the wood at the back of the owls but this is normal with these types of carved figures. These lamps have been PAT tested but with all lighting we would recommend once purchased they are checked by a professional electrician before use.